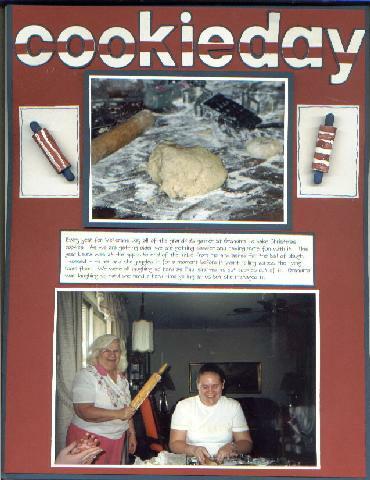 The rolling pin's and spoons are wood pieces I found at a craft store I painted them in a red white and blue to go with the Veteran’s day theme. Journaling Note: Every year for Veterans Day all of the grandkids gather at Grandma's to bake Christmas cookies. As we are getting older we are getting sassier and having more fun with it. This year Laura was at the opposite end of the table from me and asked for more dough. I tossed a big ball to her and she juggled it for a moment before it fell and went rolling out of the kitchen and across the living room. We were all laughing so hard as Paul started cutting cookies out of it. Grandma was laughing so hard she had a hard time yelling at us but she managed.